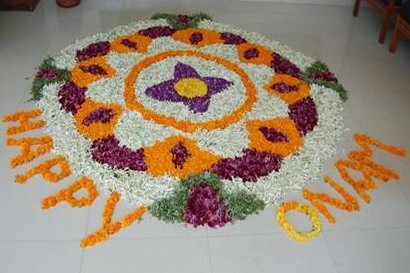 Onam is important harvest festival in Kerala, India. We celebrate this festival with lot of enthusiasm. Thinking of the times I spent Onam at home with my parents and sister makes me feel nostalgic, we used to get new clothes, and grand feast on the day. Amma cook lot of dishes. When we are young, we will be waiting for the Onam as we get 10 days school vacation. Onam (Malayalam: ഓണം) falls during the first month of the Malayalam calendar which is Chingam (August–September) and marks the homecoming of the legendary King Mahabali. Story behind Onam is that during King Mahabali’s reign, Kerala was prosperous, people were happy, no worries, no lies everywhere peace and prosperity. Because of this he got lot enemies among the the Gods, ( Mahabali was considered a demon King) and they hatched plan to overthrow him. After Mahabali was defeated by a trick played by God Vishnu, his wish of visiting his people once every year was granted. In order to honour his visit there will grand feast and flower decorations etc – the Onam festival. You will amaze to see a vegetarian banquet with lots of variety in appearance, taste, smell in all the dishes. It usually starts 4-5 curries, payasam etc served in Banana leaf. It is difficult for me to cook all dishes, so I made, sambar( Lentil and vegetable gravy), Avial( mixed vegetables in coconut sauce) and Mezhukupuratti( stir fry with vegetables) , mango pachadi, vendakka kichadi( okra in yogurt cake) and payasam. This is our Onam Sadya. Here is a simple humble Semiya Payasam. I make this more often. I used amma recipe for this. I didn’t add any extra sugar. If you want you are feel free to add sugar for some more sweetness. In medium sauce pot heat ghee and add cashew and raisins. Fry them till raisins become plums up and cashews become golden color. It takes about 1 minute in medium flame. Remove them and set aside. In the same pan fry vermicelli until they become golden color it takes about 2 minutes. To this add water and cook them for 15 minutes or until they are done. To this add milk and cook for another 10 minutes. Add sweetened condense milk and cook for 5 minutes or until it reaches desired consistency. Add crushed cardamom and fried cashews and raisins. Enjoy warm or chill. I prefer to enjoy as warm. Happy onam swathi… payasam looks delicious. Happy Onam Swathi, great looking and droolworthy semiya payasam dear.. Happy Onam! The pudding looks wonderful, I love the raisins and nuts in it! Love the Semiyan paysam anytime. Payasam looks so festive n delish!! Happy Onam to you dear. Payasam looks simply perfect. Already drooling looking at it. I love any holiday that involves good food! What a fantastic and tasty dish. Very inviting those pictures,looks delicious! Happy Onam dear, love your preparation for making this yummy dessert and it’s sugarless too..
lovely pics..Happy Onam to you and your family Swathi..semiya looks delicious! The whole festive spread looks so inviting.. and delicious. Happy Onam my dear Swathi! And thank you for telling me of the traditions behind it. Your dessert looks absolutely delicious! Happy Onam to you too! Dish looks delicious! Happy Onam! What a great feast! Happy onam to you to dear..Ona sadhya gambhiramayitundallo..yes,njanum undakki oru cheriya sadhya.semiya payasam vum adipoli..nalla oru visual treat. Happy Onam dear. The athappokolam and the elaborate onam feast looks very traditional. Beautiful snaps….feast looks delicious. Looks like you had a wonderful Onam!